It’s impossible for me to easily remember the time I noticed I wasn’t the only Crouch in the theatre. It was certainly before the time that every call centre caller started to ask if I was related to the footballer Peter Crouch, and whether I could do the robot. (Although there is another story here, one that concerns my teenage self, a Butlins or possibly another generic brand of holiday camp, a dancing competition and my utter failure to get off with the girl as a result, perhaps a direct result, of the robot). I don’t seem to be as regularly asked about Peter Crouch any more, although I don’t know if that’s because of some decline in his career, or the general outsourcing of the call centre. Other than this footballer, there are at least two Crouches of repute that immediately come to mind. The splendid Julian Crouch who’s work with Improbable and others is a continuous thread of wonder. (I particularly remember the astonishing Sticky at Platt Fields, and the incredibly intimate Spirit performed at Contact). Then there is Tim Crouch. If Tim’s Twitter nom de tweet is to be believed he’s a child of the sixties, much like me, although older by a few years. From what I can tell his hair has also male patterned much like mine. (I think the sly old subconscious is trying to draw parallels where there aren’t any). Suffice to say that I’ve heard many a good thing about Mr Crouch, in this an industry built on gossip, spit and blood. It’s only this year that I’ve finally gotten to see his work. At Forest Fringe up in Leith during the chaos that is Edinburgh, I chanced upon the nostalgic, gracious and spiteful what happens to the hope at the end of the evening made with Andy Smith. (Amongst the many things that show impressed upon its audience was – especially in us older selves – the difficulty of taking off and putting on ones shoes in the theatre, something that, in buffoonery, is returned to for a tiny comedic bit in I, Malvolio – but I get ahead of myself). hope was gently enthralling – and I particularly wondered if in form it was so very suited to those of us in our mid-life that few outside that age group could empathise easily. Isn’t it until you’ve lived a life or two that you can truly come upon old friends who are at once loved and so very very distant? I, Malvolio in contrast is aimed squarely at children, teens and tweens – although its bouffant energy is thoroughly mesmerising for any age. 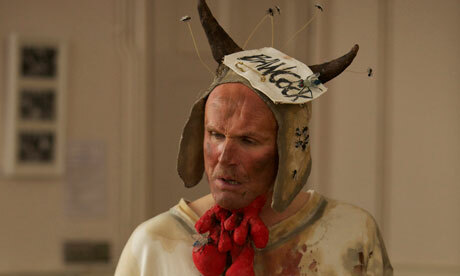 So, today, at the ever increasingly interesting Z-Arts, I saw a matinee of this incredible beast: I, Malvolio (review! review!). Mr Crouch’s most recent third person Shakespeare, which takes the eponymous Malvolio‘s side of the story to marvellous extremes. In the past I’ve only taken the most sidelong of sidelong glances at Twelfth Night, although now it seems I know the whole story of the Countess, the Lord, the boy / man / boy / man / boy and the wackiness that ensues in the presence of twins. (Do all twins live a life of confusion and farce? It seems only right). Quite rightly, this Malvolio spends much of the show deriding us bohemian audience for inappropriate attire, beverages and attitudes – constantly looking down his nose at us the mass embodiment of Sir Toby Belch (amongst other lower folk worthy of his distain). Brilliantly layered, a performance that oscillates between Victor Meldrew, Windsor Davis, the splend Mark Heap‘s Alan Statham and any archetypical stern headmaster – whilst imbued with the gravitas of a somber Beckett laden with meaning and hefty weight. It’s a clown show with a Kick Me sign stapled to its back, it’s a history lesson, a masterclass and a theatrical show-and-tell. Moments will leave you laughing til your jaw aches, whilst others prise your eyes wide with horror and anticipation. He’ll have his revenge on the whole pack of us – so he repeats throughout. And his revenge? It’s said revenge is best served cold: Malvolio’s is served before you even realise it, in a slow coagulation of the guts.